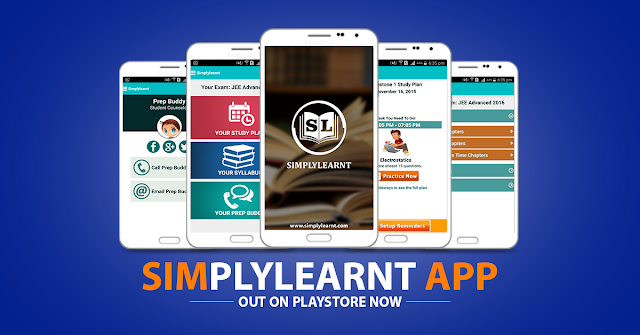 SimplyLearnt.com has launched its new android app on Google Play Store. This is full feature test prep app that provides a study plan, complete study material and connect with our student counselor to resolve any doubts. This has many improvements over our previous app, My Prep Buddy, which was also very popular among our students. The feedback provided by students on our previous app, have been diligently added to the new app. We are seeing 60% traffic to our website from mobile platform and this will be a big advantage to all those users. The students can register either on our online website or from the app and can use the website or app for preparing. Any purchases or questions practiced on either app or website will be synchronized on the other platform. We have provided all popular national and state level entrance exams for engineering and medical streams for students studying in class 9 onwards. The app provides you a 9-miles guided study plan which divides the preparation for an entrance exam in 9 easy to do steps including practice and revision. For the exam selected in the app, complete syllabus for all subjects asked in the exam are provided. The syllabus is divided into three categories of importance. Do or Die, i.e. most important chapters, Should Do, i.e. slightly less important but still counting for a significant questions asked in exam and finally Do If You Have Time chapters. For each chapter in the syllabus given full study material is provided. Timing tests to master timing on the tests. We understand that the students face doubts and queries during their preparation and we have provided access to our student counselors in the app itself. The counselor provide a response to the students within one working day. The study material is available in demo mode and full access is provided under SMART subscription. Students can purchase SMART subscription for more than one exam. All the exams purchased by a student are available in the same app. All the purchased exams are available in the menu. On selecting the exam from menu at any time, it will change the syllabus and study plan in the app itself. The app is already available on Google Play Store and we are actively working on students' feedback and posting regular updates on Play Store with improvements!